Instant View is a technology crafted to perfection by Telegram's developers. It optimizes all of the supported web pages explicitly for mobile devices and makes them load instantly, no matter what is your Internet connection speed, by caching them onto their servers, hence why it is called "Instant View". Version 2.0 is a welcome upgrade over version 1.0, and we will go ahead and explain why just in a moment. Before that though, we would like to note that there is not an official statement by Telegram about what are the exact changes in this update, but alas, we got some more insight details, which are based on the changes in code on GitHub, examined by some folks at the Russian website ROZETKED, and more information from the Telegram Beta channel. The guys at ROZETKED are saying that other than tables and nested lists, file attachments are supported too. But as of this exact moment, there is no preview that we can show off to you with the third one because Telegram v5.0.0 is still in beta testing. Perhaps, you can at least try these two example links below, which do have nested lists and tables working with Instant View. Instant View is a great innovation, and version 2.0 is a minor step up, but sure enough, it will be improved furthermore. A big surprise is that this new version is nowhere to be seen on the Telegram X app because it is more like their number one app to get early and experimental stuff. 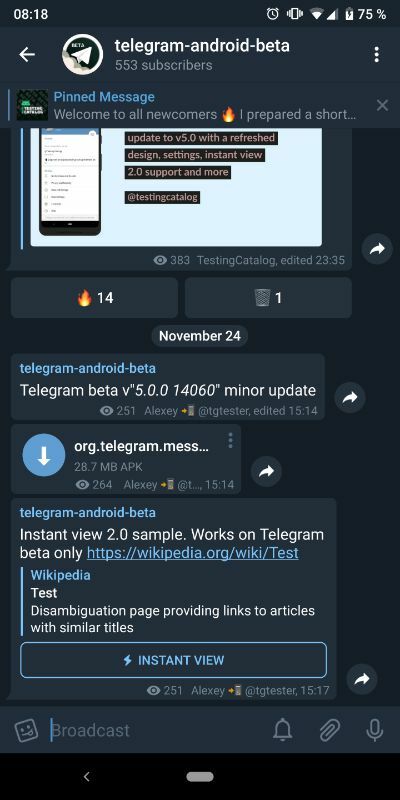 Here you can also see the difference between Telegram client w/o Instant view 2.0 support and Telegram beta with Instant view 2.0 support. 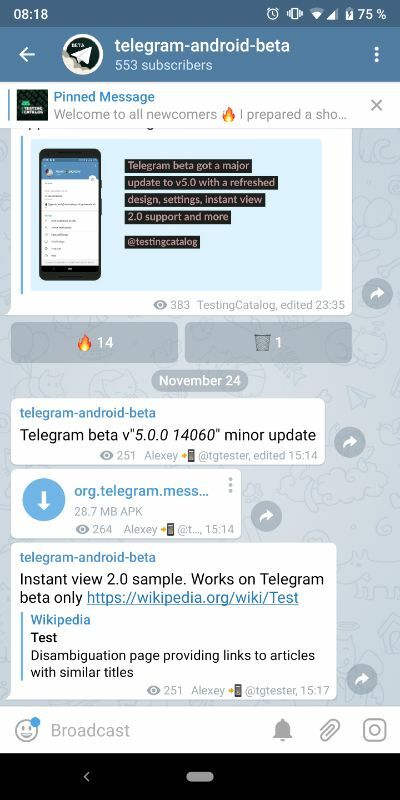 If you are interested, you can download Telegram v5.0.0 from TestingCatalog channel about Telegram and install it on your Android phone.